Bulgaria's former European Commissioner Meglena Kuneva cannot end up at the Constitutional Court, CC, over her eligibility to run for president, according to a former CC judge. Former constitutional magistrate, Dimitar Gochev, made the comment for the Bulgarian Trud (Labor) daily, in the heels of threats, coming from the leader of the far-right, nationalist Ataka party, Volen Siderov, who vowed to attack Kuneva's nomination in CC on grounds she is in violation of the Constitution. The Bulgarian Constitution requires that candidates for president are eligible only if they have lived in the country for at least six months in the last five years. Gochev says the CC cannot rule in this case since it already resolved it in 2001, while article 21, paragraph 5 from the CC Act bans two rules on the same matter. The magistrate cites rule 8 from 2001 of the CC, which postulates that "Bulgarian citizens, who were sent or nominated by the Bulgarian State to conduct activities abroad do not interrupt their residency in the country and keep their right to run for president." 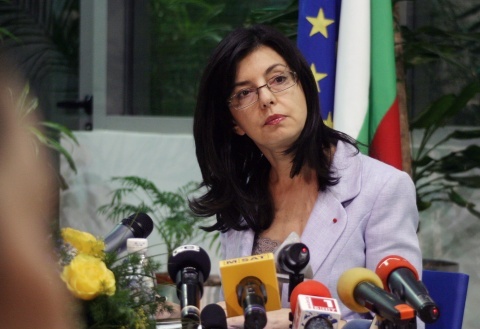 In the period 2007 – 2009, Meglena Kuneva, has been EU Commissioner on the nomination of the Bulgarian State with a decision of the Council of Ministers, dating from October 26, 2006. After the end of her term in 2009, in April 2010, she has been appointed an advisor to the EU Transport Commissioner, but for these duties she did not have to live in Brussels, her campaign headquarters point out, adding she had a registered address in Sofia and could prove residency in the Bulgarian capital with airline tickets and other European Commission business trip records. Gochev stresses it is high time everyone in Bulgaria realizes that under the Lisbon Treaty all authorities and institutions of the EU are considered to be Bulgarian as well and Bulgaria is included in the Union's administrative mechanism.